Suite Eight is an one bedroom suite and occupies half of the ground floor of the mansion house (110 sqm/1184 sq ft). 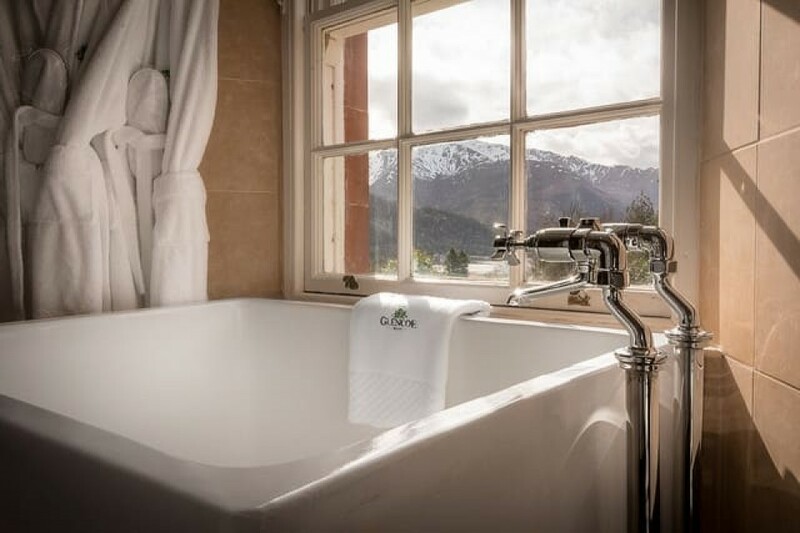 Like all Glencoe House Suites, Suite Eight consists of a generous sitting room with period features and an open fire, restful bedroom with slipper bath and luxurious separate bathroom, all with views of Loch Leven. 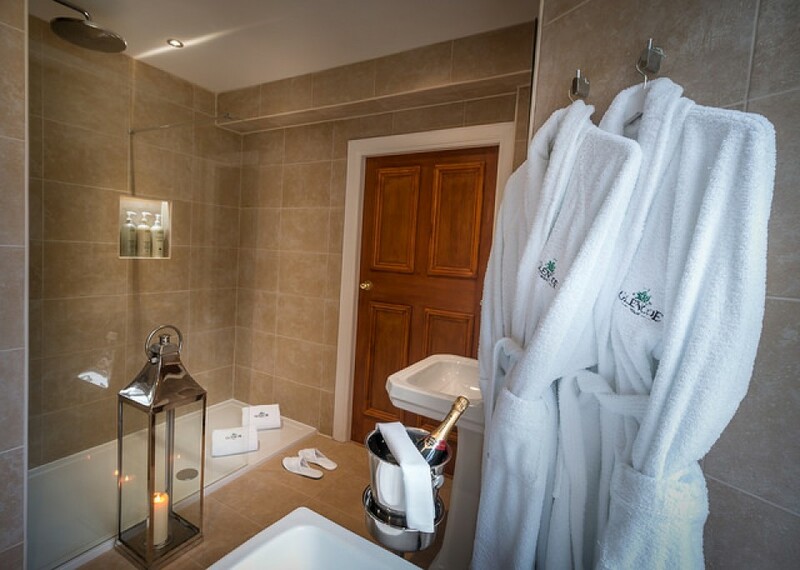 If that wasn’t enough, Suite Eight has a large private terrace with dining area and hot tub; where else would you want to relax and look at the stars? 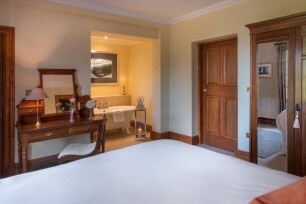 The suite offers guests the chance to relax and recuperate in splendour. 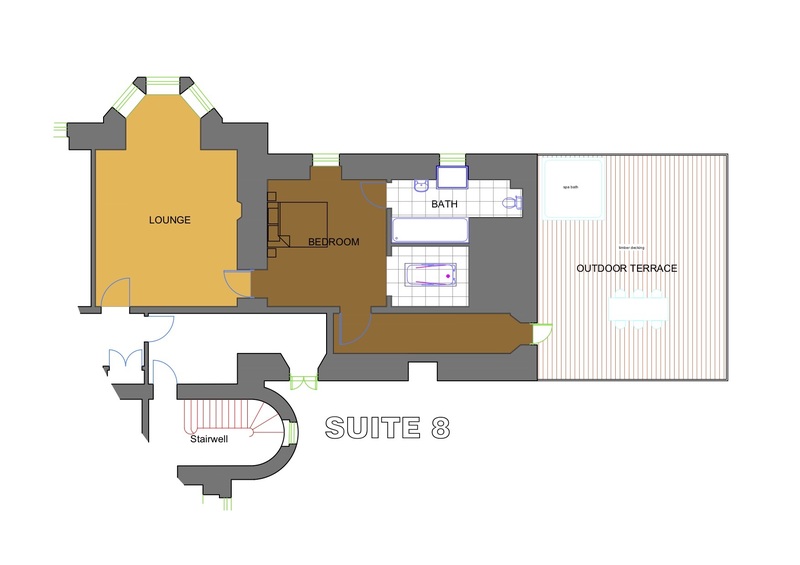 The total floor space of Suite Eight is 110 sqm/1184 sq ft and a floor plan is available here. 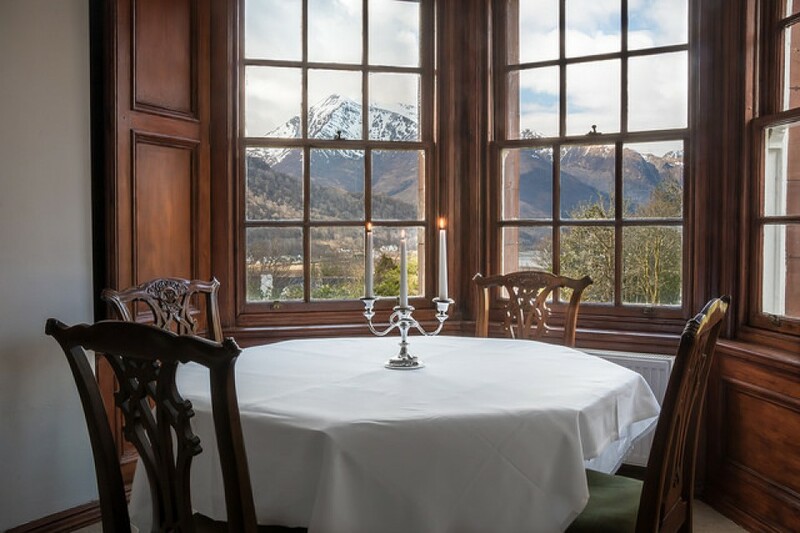 In the private sitting room, the eye is immediately drawn to the large bay window that frames the magnificent view of Loch Leven. 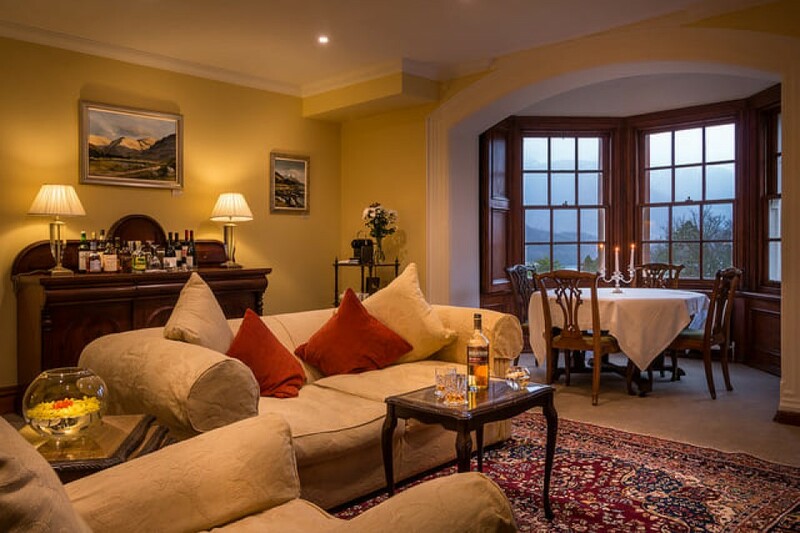 Once you can bear to move away from the window, you will see a substantial sitting room warmed by an open fire and decorated in warm golds and rich burnished coppers that just lure you into a relaxed mode. 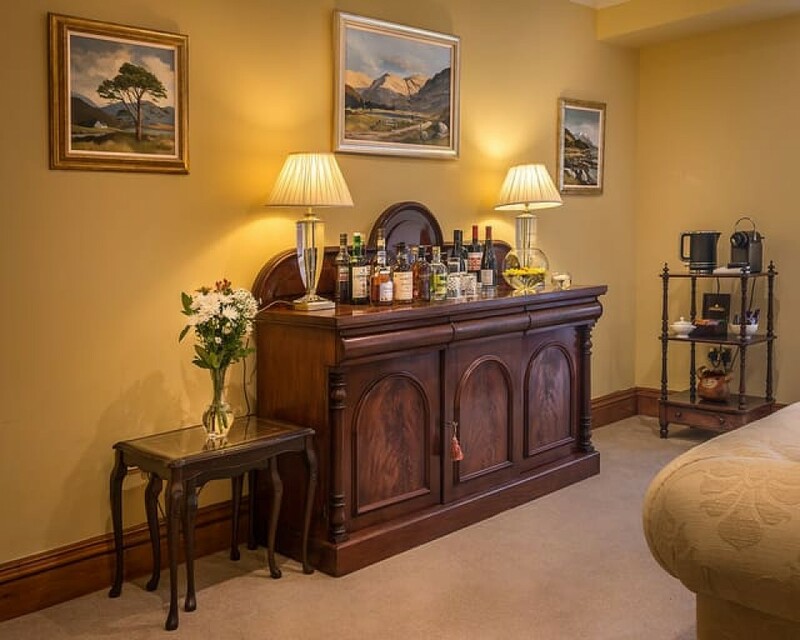 Sink into the comfortable sofa, reach for a malt whisky or a glass of champagne from your maxi-bar and watch the flickering flames of the fire; you will find that life’s tensions will simply seep away. 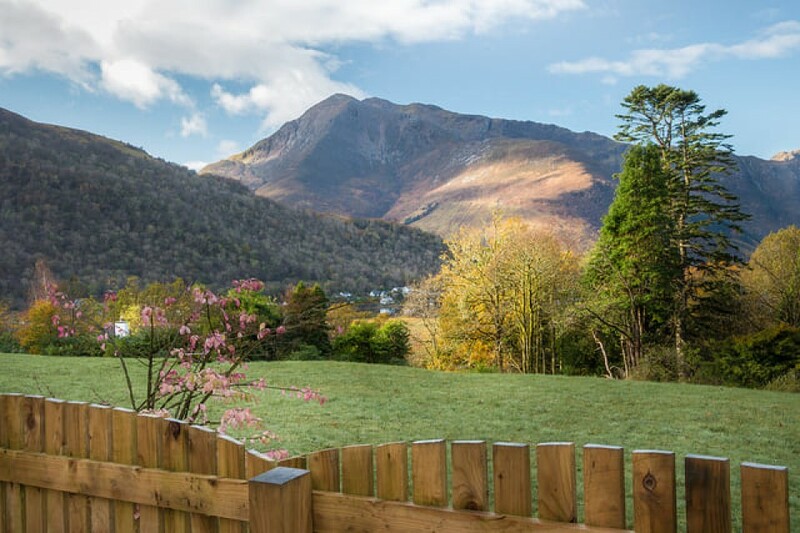 Alternatively catch up on a film or two with the 3D television with international channels and DVD player, or explore a new musical genre with the in-suite iPod and Bose sound system with 19,000 tracks; there will be undoubtedly something that makes your feet tap. Dine in style at your private dining table, which is in the bay window. If you are travelling with friends or family, it might be useful to note that this table seats up to four people. There is no need to fight for the prime table in the room as is it already yours, whether it is eating eggs benedict for breakfast in your bathrobe, or, dressing up for a celebratory candle-lit formal 5 course dinner. 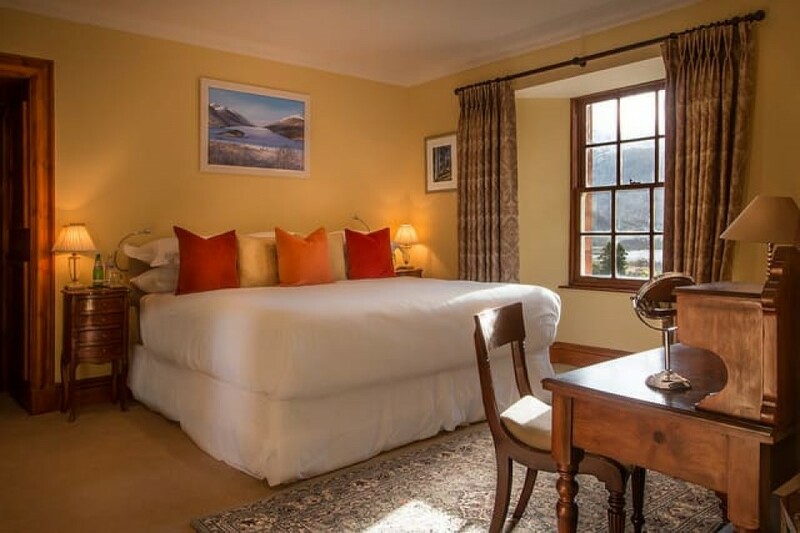 The bedroom of Suite Eight boasts an emperor size bed, which benefits from the Glencoe House Rejuvenating Bed Concept which makes it seem as if you are sleeping on a cloud. Please note that it is not possible to have twin beds in this suite or an extra bed. 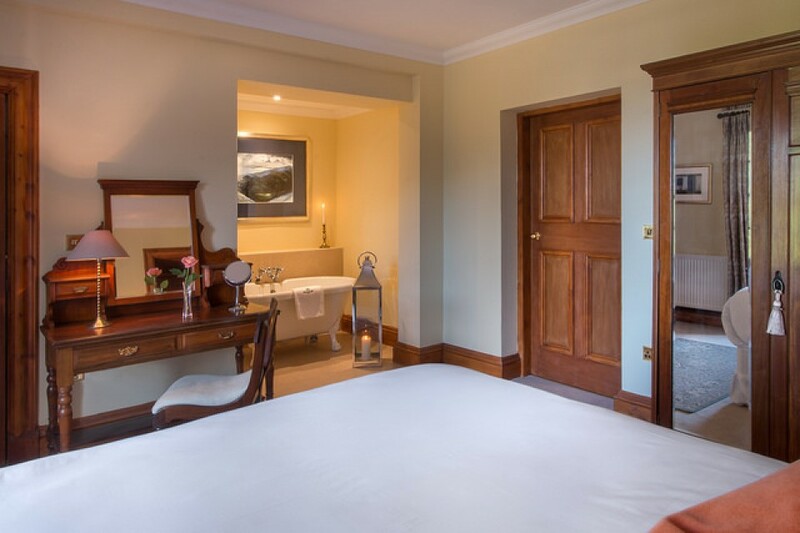 The furniture in the room is very much in keeping with age of the building with period dressing table with matching bedside tables for that refined touch. The bedroom also has a roll top bath so all you need to decide is whether you want bubble bath or bath bombs to scent your bath. A glass of champagne while in the bath? 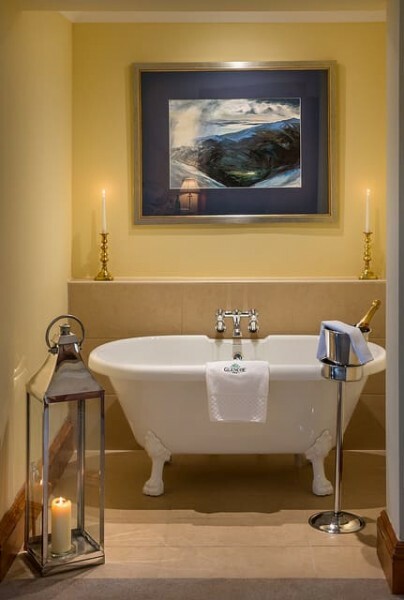 Why not, as there is champagne bucket within arm’s reach of the bath for your convenience. The warm ambiance of the bathroom is created by the soft caramel coloured tiles and the candles. Suite Eight, rather unusually, has two baths. Choose between the roll top in the bedroom or the Japanese style bath in the bathroom. You may ask what is a Japanese style bath? It is very deep bath but is shorter than a conventional bath; it is great for relaxing the shoulders and neck. If you prefer a shower, no problem. Suite Eight bathroom has a Hansgrohe raindance shower, which has generously sized Aveda products. The room has a WC and handwash basin with Penhalgion products for your enjoyment. 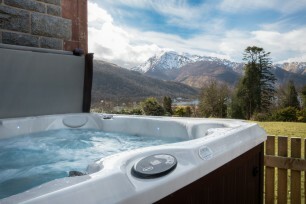 Suite Eight benefits from a large private terrace (130 sqm/1291 sq ft) with dining area and hot tub. 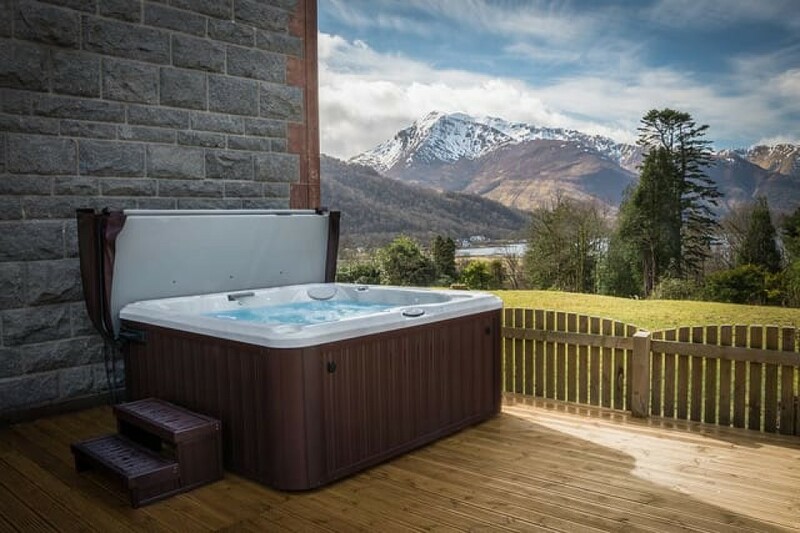 Sitting in the hot tub enjoying the views of Loch Leven is perhaps the ultimate in relaxed living! We are afraid to say that this suite is not dog friendly.